North Dakota's energy boom led the state to have the fastest-growing economy in 2012, increasing at five times the national average. Propelled by a massive energy boom, North Dakota once again captured the title of the nation's hottest economy, with a growth rate five times the national average. North Dakota's economy posted a 13.4% growth rate in 2012, according to a report released Thursday by the Bureau of Economic Analysis. That's nearly three times as fast as the number two state, Texas, and trounces the national average of 2.5%. This is the third year in a row that North Dakota took the top spot in BEA's state-by-state report on gross domestic product (GDP). The muscle behind the boom is a surge in oil production from the Bakken Shale, an underground rock formation in the northwestern part of the state. Thanks to high oil prices and new drilling technology -- including the controversial hydraulic fracturing, better known as "fracking" -- oil production in North Dakota is now six times higher than it was in 2007. In 2012, North Dakota surpassed Alaska and California to become the second largest oil-producing state in the nation behind Texas, according to the U.S. Energy Information Administration. 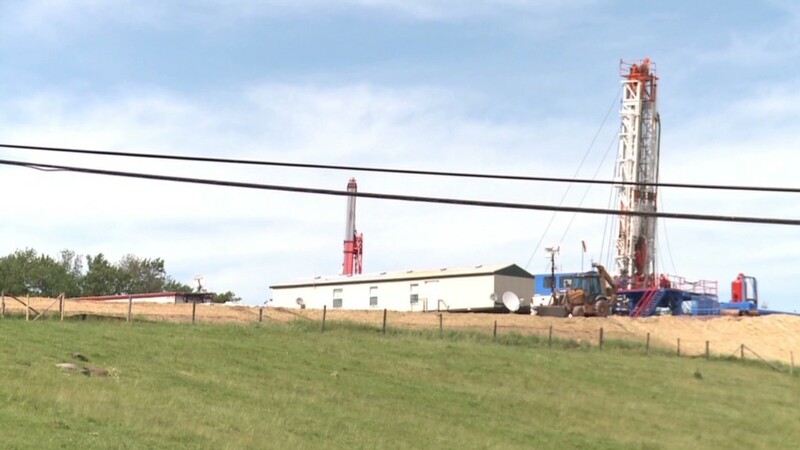 The boom has attracted workers from all over the country and rippled out to incorporate not only the oil and gas drilling sectors but also other industries that supply them, including wholesale goods and transportation. "There's nothing like an oil boom to get things rolling," North Dakota Governor Jack Dalrymple told CNNMoney. Unlike some other states, North Dakota has a tax specifically targeting oil and gas production. That tax has allowed the state government to cover 80% of the cost of public schools, greatly reducing property taxes on the local level, Dalrymple said. It also allowed for a reduction in state income taxes, and covered the cost of building roads and other infrastructure to accommodate the influx of workers. There are still downsides to the rapid growth. Housing prices in parts of the state are as high as Manhattan, and some areas are having problems obtaining enough water. But the state's unemployment rate is below 3%, and North Dakota is "hanging on to our college graduates like we never have before," Dalrymple said. Oil and gas is the biggest economic driver, but Dalrymple said his state is also doing a good job attracting other industries. Deere & Co. (DE) and Caterpillar (CAT) are building factories in the state, and an Amazon (AMZN) service center is also in the works. The second fastest-growing state was Texas, which benefited from oil and gas activity in its own shale formations as well as a strong showing in its manufacturing sector. In fact, the manufacturing of durable goods -- things that last longer than three years, such as cars, appliances or software -- grew by more than 9% nationwide in 2012, according the BEA. It was the leading contributor to growth in 22 states, the bureau said. In Oregon -- the third fastest-growing state -- manufacturing contributed almost 3 percentage points to the state's GDP. Computers and electronics dominate Oregon's manufacturing industry, with Intel (INTC) in particular leading the way, said Josh Lehner, a state economist. The company has been expanding its chip manufacturing plants, as well as its research and development unit in the state. Washington and Minnesota rounded out the five fastest-growing states. Washington's growth was led by tech and manufacturing, while manufacturing and finance fueled Minnesota's. The laggards: Connecticut was the only state to see an actual drop in economic activity, with its gross domestic product falling by 0.1%. Connecticut has a large insurance and finance sector, which posted a fairly sharp decline. Economists have said growth in the insurance and finance industry will likely lag other sectors as the market continues to adapt to the fallout of the 2008 financial crisis. The Dodd-Frank finance reform bill, the implementation details of which are still being worked out, is also expected to limit the sector's growth. Delaware was the second slowest-growing state, dragged down by contractions in the construction and wholesale trade sectors. 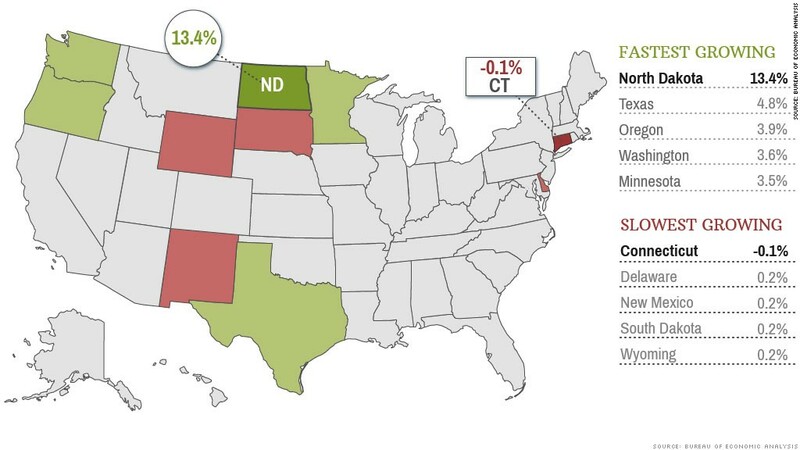 New Mexico, the fourth slowest-growing state, also saw a decline in its construction sector. Declining construction activity was not the norm nationwide. Construction activity grew by 3.2% across the country in 2012, BEA said -- the first annual growth posted by the sector in eight years. South Dakota was also a slow-growing state, and had the sector with the biggest single drop: agriculture, which knocked 2 percentage points off the state's GDP growth. South Dakota is a big cattle-producing state. The drought in the summer of 2012 pushed up the prices of corn and other grains, squeezing profits for ranchers that use the crops for feed.